I found your page and found it to be useful and followed the instructions like you said but it's not fooling the warning system. So it stops sending any kind of power to the harness. Is there anything else you recommend trying (at my own risk of course). I really hate to get rid of these lights. Oh and it's a 2003 E320 W211. Turn off the DRL from your instrument. p.s. make sure the capacitor is install correctly. It is Uni-direction. One end connected to positive and one end connected to negative. I also have a 2003 model, I don't see how yours wouldn't work. Last edited by no_clue; 07-10-2007 at 01:36 AM. If that manual is on the same one as the fuse chart then i dont have it. Otherwise i'll look in the owners manual. And how would i turn that off anyway? Is it a fuse that i have to disconnect? Also, the capacitor is on the right way. i'm sure i got that much right. The switch on the left of the steering wheel has an "Auto" position. i don't believe that's DRL. In either case, whenever i test it i turn the Knob all the way to the right. Last edited by SuperCarver; 07-10-2007 at 11:46 AM. NOPE, you do NOT mess w/ any FUSE! Look at those button on your left side of steering wheel. There should be "page icons". Play w/ that to go into menu. In the sub menu of "lights" there is "Lamp current". Switch to "manual"
Ok. That was already in the manual position. Maybe it's the capacitor that's shot. I'll get another one. The system that i bought requires me to plug into only one of the factory harnesses and that will send the signal for both ballests to ignite. So if i bought another capacitor and plugged it into the factory harness that i won't be using, will that fool the system into thinking there's a bulb in it so that i won't have a warning for the left side bulb maulfunction appear? You bought a kit that only require one power input from either passenger or driver side? MB has two separate current detector for the both headlight. And NO!!!! you can't just install a capacitor on a UNPLUG headlight outlet!!! Capacitor is NOT a resistor. It does NOT actually consume/dissapate voltage. most likely it will be too hot to leave it anywhere close to your headlight housing. What kind of kit did you get anyway? Want to post a pic? 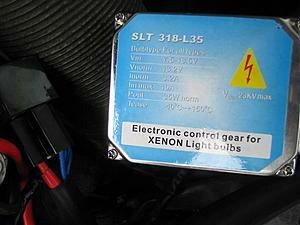 I look at the ebay "HID Kit" and almost all of them have separate ballast and power input. Last edited by no_clue; 07-11-2007 at 01:50 AM. Thats right, and 2 ballasts. This is why i need to put a resistor on the other end. (I know it's stupid) But just to see if it worked i wrapped one wire on each bulb pronge, connected the HID lead to those wires and plugged in the halogen. Everything worked, Of course i can't leave it like that, i just wanted to see if it worked without any codes going off. (except of course the side thats not plugged into anything). Check it out. Hope this helps you help me. The suckass part about this is there's no turning back on the lights cuz i already modified them. So i'd really like to get them working without maulfunctions. So i'll take yet another trip to "The Shack" as i like to call it, and pick up a resistor for the side that isn't getting plugged into anything. 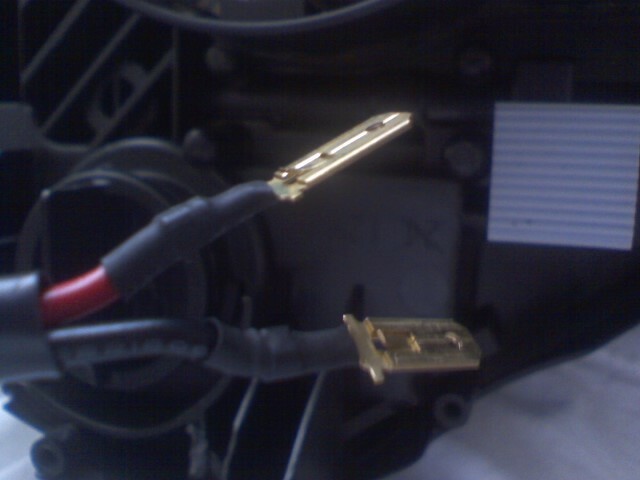 When i put the Capacitor on, i got 2 wires, put the flat clips on one end to go into the factory harness. Then put the capacitor on those wires and then put another set of clips on the other end and then plugged the HID wire in. Just so that i don't break with the factory wire jacket if it didn't work and i don't have to work in a tight space. If it's a must at this time that i splice into the factory wires then i will, but i don't see the difference in adding 6" to it. Last edited by SuperCarver; 07-11-2007 at 12:26 PM. p.s. if you do insist put on a resistor. Please install your old halogen bulb back and use Multimeter to meausre the amp and resistance of the line. Then maybe I could give you accurate info on which resistor to buy. Last edited by no_clue; 07-11-2007 at 02:53 PM. yeah it is. So your say that i won't need the relay cuz the capacitor is gonna be my 12v source? you do not need relay!! The reason some kit come w/ the relay is due to some car equippied with small battery w/ less cranking amp that will not be able to perform "initial power up" (most 35W HID need approx. 85v~ 145v to ignite) from their system. 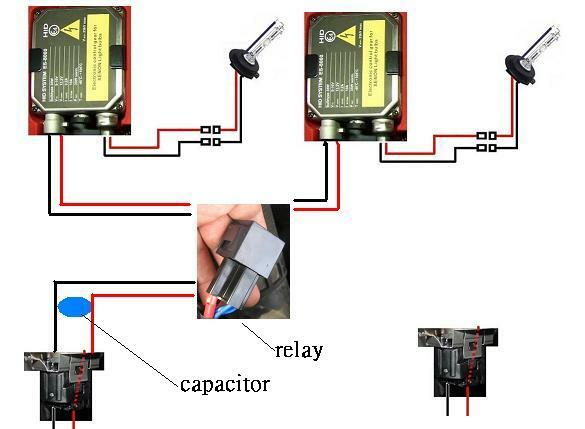 Relay ( in this application ) is generally designed to connected directly to your battery!!! And I am not sure what you meant, but capacitor is NOT source of power. 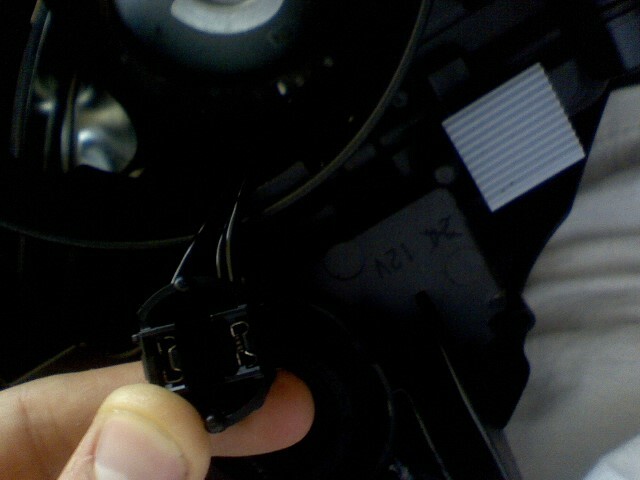 Think of the capacitor is a "little back up battery". 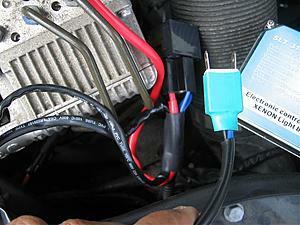 That voltage is collected first into the capacitor and during "ignition" it will provide those extra power. p.s I am afraid you are not very familiar w/ EE, but MAKE sure your ballast is properly insolated!!!!! (For safe side, I even have entire ballast sealed in rubber housing) DO NOT, I repeat DO NOT install it next to your ABS Control Module!!!!!!!!! Last edited by no_clue; 07-11-2007 at 05:43 PM. No, not too familliar so i really appreciate you taking the time to explain all of this. I do understand the what your saying about the difference in voltage it requires to ignite/stay on. But the car stops sending ANY kind of volts when it thinks there's a burnt bulb. It sends a surge (if you would) every 30sec or so just see if there a good bulb in i guess. This is where i thought the capacitor would come into play. So, fooling the ECU is the trick here so that there's a constant flow of power and i'll then do away with the relay so that both factory harnesses will be connected to it's own ballast. My apologies if i'm getting you fustrated about this. Ooops.. I am not fruastrated. It is my poor english, that it may sound harsh. In fact, I just wish everyone do it right and save money!! p.s. Another function of capacitor is to maintain current stablity. Notice there are many capacitors on your computer motherboard? 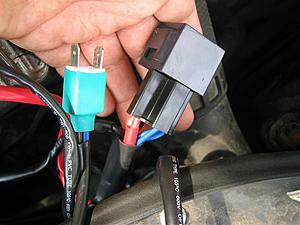 When excessive current (ECU senting surge) occur, it will simply pass through groud wire instead of designated device. Let's take capacitor like a dual water container. A. 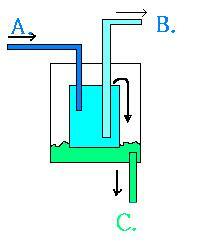 Water come into the inner tank. B. Water pump to your house in stable pace, w/out overload your water pump or change pressure. If all the sudden excessive water flow into the inner tank, it will spill out of inner tank and drain out to ground C.
Last edited by no_clue; 07-11-2007 at 06:37 PM. Hahaha ok. As soon as i can get to the car i'll try that. Is the whole 6" extention rig with the capacitor in it ok or should i just splice into the factory wire? oh and i mounted the ballasts on the metal that is above the headlight housing (on each side). Where the tags are. Not sure where the ABS modulator is. Guessing it's by the wheel below the headlight. GO to auto shop, and get a high quality wireset. NEVER mod/ splice your factory wires! ABS is that little spider looking thing on your second pic. Ok. i'll do that and relocate the passenger side ballast. IT WORKED!!!! WOOOHOOO! Your the man! Thank you so much. I removed the relay and relocated the passenger side ballast under the headlight in the wheel well to keep it away from the ABS modulator. Thanx for that tip. Again, thanx for your help. Hopefully i can help someone the way you have. You are welcome. The person you should be thankful is Allan, Health Service. p.s. post some pic of your headlight. To all who's shopping for a kit, please don't fool yourself by buying the most expensive kit you can find and thinking it'll be worth the money. I spent 850 for 2 H7 kits (one for the e55 and one for my wife's slk350) when i could have went with 2 ebay kits for $250 or 2 waterproof kits from mobileHID for 500 total. If i were to do this again, i'd definitely opt for the ebay kits or the waterproof kit for peace of mind. i found your write up quite helpful. I bought a Cheap no name HID kit A-tek h7 8000k for 100.00 and i nstalled it but I drilled the hid ballast behind the headlight itself i removed the whole light to do it and i put it thru the rubber cover and tycked all the wires in there. I bought the resistors and T-taps and installed them and the lights turned off when i took them of the lights came on. I was very surprised for a cheap HID kit that doesnt throw any codes and doesnt flicker Kinda lucked out but I appreciate he help the only thing was the metal bracket couldnt fit through the wires so i cut a line thru and fit it under the bulb but everything came out clean. So thanks again Bro. Last edited by Abboushi; 08-03-2007 at 02:28 PM. Since I haven't seen one w/ only one wire connection, take a pic of both side. They are both black. I attached a couple pics. So I'm basically asking where the red wire goes, double or single and same for the black. Can someone please guide me in the right direction. red one on the kit is definitely positive lead. p.s. what model year of W211 is that? There are many people actually email me w/ their photo want me to id the lead, but I haven't seen one that colors looks like yours. Last edited by no_clue; 08-04-2007 at 07:08 PM.